How to Clean Menu Covers. Everyone would like their menu covers to always look like new and have them last forever. However, all menu covers will over time show wear and eventually have to be replaced. A quality made menu cover will last a long time, out lasting a lesser quality cover. Knowing how to clean menu covers and the proper care of your menu covers will help extend the life of the cover as well as to keep them looking good. Many menu covers have the restaurant name or logo foil stamped and sometimes this foil will appear to wear off over time. Since this logo is usually de-bossed, where the material is compressed and lower, it is not subjected to rubbing and should not wear. So the illusion of wear is not the result of excess wear, but the result of cleaning with harsh cleaning chemicals actually degrading the foil. The foil is coated with heat sensitive glue and applied with pressure and approximately 250 F of heat. The heat sensitive glue is water proof, but not chemical proof. Cleaning chemicals can attack the glue under the foil, causing the glue and foil to come off making your covers look old and worn before their time. Cover materials are manufactured with a protective coating. Cleaning with harsh chemicals will over time attach this coating making the covers look dull and increase the aging process. Cleaning your menu covers should be done with plain warm water and, if you must, a few drops of mild detergent mixed with water. After cleaning the covers, be sure to dry them with a soft cloth removing any residue. Cleaning your covers in this way will add years to the look and life of your menu covers. Quality is a great factor in the wear of restaurant menu covers. Of course the better the quality of the materials used in manufacturing the better the quality of the cover and the longer it will last and stay looking new. Some “manufacturers” actually purchase the covers they sell, in bulk from other countries made with lesser quality materials. These cheaper covers are sewn with cotton thread rather than nylon thread and are particularly subject deterioration, not only from cleaning chemicals but just plain warm water. One of the most popular covers frequently imported are Cafe covers, clear menu covers with colored binding sewn around the edge, which can be bought at wide range of prices depending on the quality. The clear vinyl used in lesser quality covers will deteriorate over time and crack and turn yellow. The use of harsh cleaning chemicals will speed up the deterioration process. Good quality Cafe menu covers sewn with nylon thread and quality vinyl will out last one made with inferior materials. It is also less subject to deterioration from cleaning but, still should only be cleaned using warm water and if necessary, a few drops of mild detergent. Storage of restaurant menu covers is another issue. 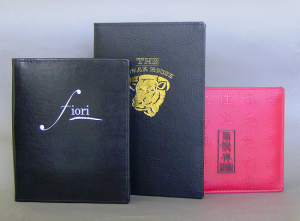 Storing your menu covers on their side will cause more wear and damage by banging and rubbing of the edges. 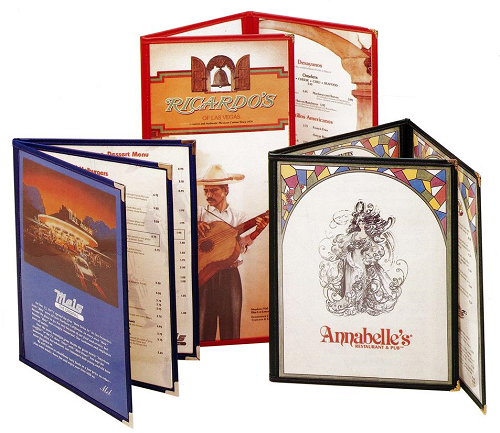 The best way to store restaurant menu covers is flat preventing excessive wear. If you are not storing your menu covers flat, you should consider it. Knowing how to clean Menu Covers and following these cleaning and storage tips will extend the life of your menu covers and keep them looking good. A good quality menu cover will far out last a cover made with lesser quality materials.